> According to Al, Delaware is so tiny, it should only have one city…Delaware, Delaware. > Jarrett having spent almost his whole life in New York never realized that the NJ Turnpike and I-95 were not the same. Glad Al was driving. 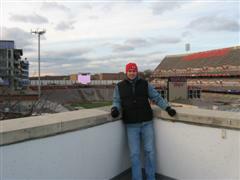 We arrived in College Park with plenty of time to wander around campus aimlessly. 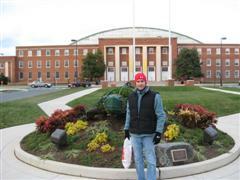 We had both been to the University of Maryland before and it was agreed that this was the nicest campus to date. We did observe that the campus had a no right turn sign as well as a stop sign at the exit to an entrance only lot and going onto a one way street. Very confusing (even more than the preceding sentence) and a lot of signage for a simple exit. I also had a lot of difficulty with the difference between President Street and Preinkert Street and no alcohol was involved. Not a good sign. 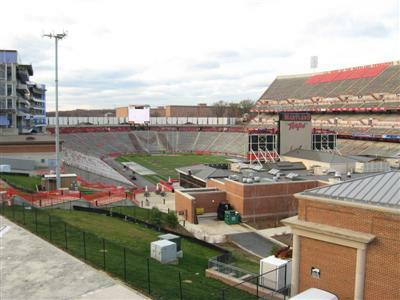 Also, Maryland did not have any postcards of the stadium. Why is it that I could only find this at Northern Illinois and not Maryland or Texas ? As game time approached we discovered that Maryland was incredibly organized in terms of game parking and it was very well done. Nice job, Maryland. Take the compliment now because the insults will be flying shortly. The tailgating was good, although there was way too much discussion about balls, meatballs that is. Also, tailgating spots are reserved. Nice idea. 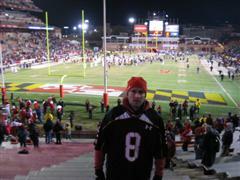 We spent some time getting free drinks and shots with some random Maryland fans prior to meeting up with Ms. X. Thank you anonymous Maryland fans, although I think they were really Ravens fans just there to drink. There were plenty of turkey legs in a pile of beans that someone dumped for all. There were also no words that could describe Ms. X’s 7 layers of coats that reminded us all of The Nanny. Very friendly tailgating and it was a lot of fun. This brings us to the weather. It was 34 degrees with a low of 24. This was bitter cold although I was better prepared and did not feel nearly as cold as at Northern Illinois. It had even snowed a little on the drive down to Maryland. Al decided that he needs better gloves and hand warmers. Why he didn’t learn that in DeKalb, I will never know. 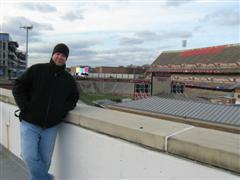 But I know I am not looking forward to the colder venues. The walk from the parking lot to the stadium was the most absurd walk I think I will ever be on. There is a bridge from the lot towards the stadium that requires you to walk single file. Imagine loud, drunk crowds forced to whittle into a single file line to walk towards a stadium over an old small bridge. Not the brightest idea some UM engineer has had. The entrance to the stadium was one huge bottleneck with just a mass of humanity trying to get in. Obviously, the designer of the parking situation (good) had nothing to do with designing the stadium (very bad). If we see a worse stadium entrance procedure on this quest, it will be shocking. The news only got worse, as when we finally got to our seats 5 minutes into the game, the game was over. 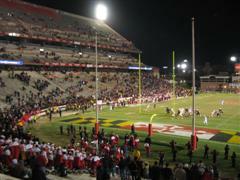 This game was blowout of monumental proportions as Maryland lost 37-3; and it was not even that close. 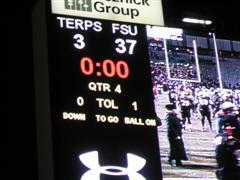 Too bad, as I was hoping to actively root against FSU the whole game. The stadium was half empty at halftime and almost completely empty by the end of the 3rd quarter. 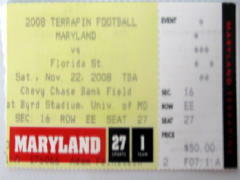 This reinforces the belief that Maryland is absolutely awful in black out games. Maybe they should go back to red or spend the marketing dollars spent in marketing the black out concept towards recruiting. The on field band was terrible and the band continued to play after every play in the 4th quarter after there was no one left to hear them. It is our belief they were purposefully trying to drive the cheerleaders crazy and force them to jump up and down in the cold after every play. After listening to the conversations around us during the game, I am going to make an observation. Granted the game was over early and there was nothing to even watch, but despite this, I am confident in making this declaration…. 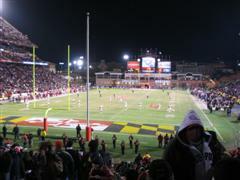 Maryland has the drunkest, most ignorant football fans in the country. They may think the first part is a badge of honor but in this context, it is not. If any school beats them on this count, I will weep for the future of this country. I do not think we will ever encounter a complete lack of knowledge about football anywhere and at any time in any dimension. And we never did make it to the pole dancing party at a warehouse in Baltimore these two idiots in front of us were discussing for the entire game. On the way home we stopped at Delaware Park and I had my first experience with video table gaming. I am not sure if the fact that I liked it indicates I have a problem with gambling or with being social with other people, but I enjoyed playing blackjack with only a video screen. And I only lost $10. Much better than most of my other gambling outings. On the way home I even got to donate $4 to a CW (abbreviated because my wife thinks my kids will read this one day) with a sob story. I felt better about myself although Al felt it made the world worse off than it was before (he has his reasons). Not a bad first road trip. I finished the year 3-0 in picking the games while Al finished 0-3. And no, we do not need to pick different teams, which makes Al’s performance all the more awful.